The secret is pretty simple. Prep the chicken however you want to prep it. For a dinner party I threw last Thursday, I bought two 4 pound chickens the night before (that would be Wednesday night). I cut them up into 10 pieces each: two wings, two thighs, two legs, and I cut each large breast into four. I poured a few cups of buttermilk into a large Tupperware container and seasoned it with many many dashes of Tabasco. I added the chicken pieces, the cover went on and into the fridge it went, overnight. The next day, in the afternoon, I took the container out to let it come to room temperature. And at 7 PM, before my guests were due to arrive at 8:15 PM, I set up my chicken frying station. It may not look glamorous, but this is how you fry chicken for a crowd. 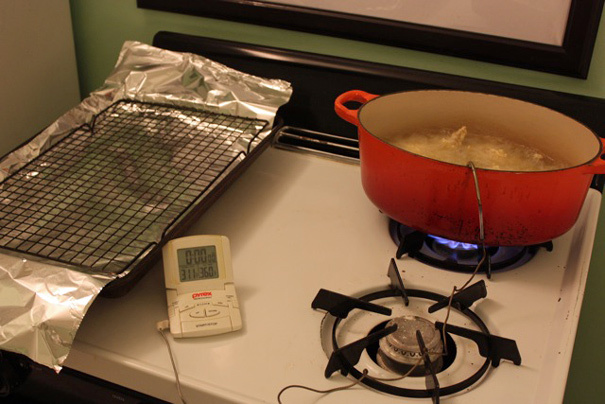 Get a large cookie sheet, line it with aluminum foil, and place a cooling rack on top. On a back burner (important, in case there’s splatter) add an inch of canola oil to a Dutch oven (that’s less than 1/4 of the way up). Now place a thermometer in the oil and heat it until it’s 360 degrees F. Meanwhile, preheat the oven to 350 F.
In a large bowl, add several scoops of all-purpose flour and, depending on the recipe you’re using, a good sprinkling of salt, pepper, or if you want to make Charles Gabriel’s version (see here) garlic powder, onion powder, paprika and so on. When the oil is at 360, take 4 pieces of chicken out of the buttermilk, and roll them around in your flour mixture. Get them really well coated. Then very carefully lower them into the hot oil. 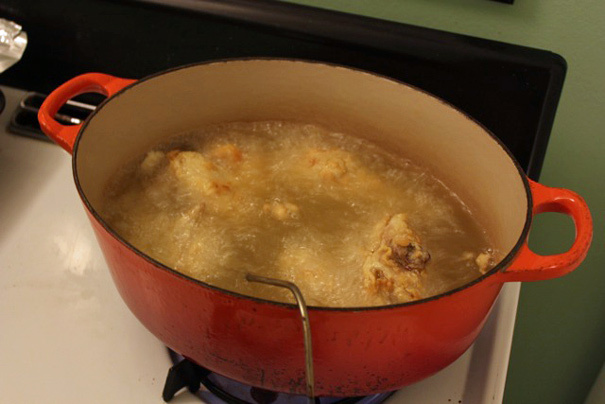 Do this one piece at a time and watch the oil–if it’s bubbling up too high, wait before you add the next piece of chicken. The biggest danger here is that the oil will spill over and catch on fire. Ya, that’s scary, so be careful. Also: you might be tempted, as you go, to fry many, many pieces at once but that’ll drop the oil temperature too much and you’ll wind up with greasy chicken. Here, you’re just frying the chicken pieces for a few minutes at a time until they have a nice golden crust that’s not too dark. It’s going to finish in the oven (this is all inspired by a Barefoot Contessa recipe for “Oven-Fried Chicken”). When you have a light golden shell of fried wonderfulness on the exterior of your chicken, use tongs and remove it to the cookie sheet. Continue with the rest of the chicken pieces until you’ve fried them all and your tray is full. 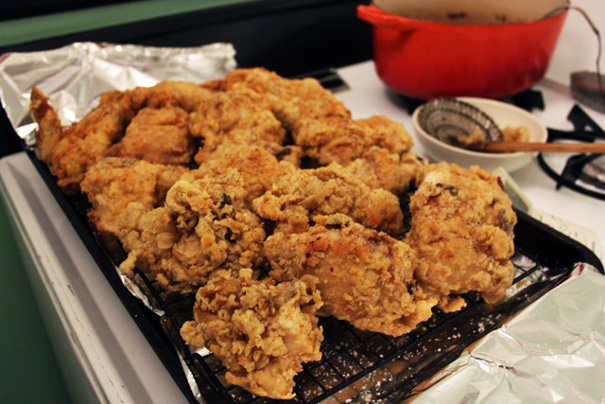 Now look at what you’ve done: you’ve prepped a bunch of fried chicken for a crowd that’s going to finish in the oven. Turn the heat off the oil and pop that tray in the oven for 30 minutes. Go hang out with your guests and 30 minutes later say, “Who’s hungry for fried chicken?” Take the tray out of the oven and cut into a few pieces to make sure the chicken’s totally cooked through (the breast pieces will cook faster than all the others, so if the breast is done and the thighs/legs aren’t, take the breast pieces off the tray and stick the dark meat back in for a few minutes). When all of the chicken is done, give it another sprinkling of salt before serving it up. 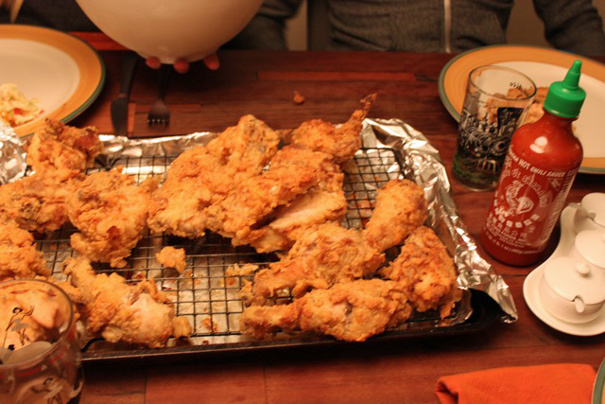 Next time you cook for a crowd, make fried chicken. It’s easier than you think.